Jim Dodson Law's Bikes for Kids for Christmas Smiles all around at Chainwheel Drive when we were privileged to make Christmas a little brighter for seven great kids with new bicycles and new helmets. CLEARWATER, FL, Dec. 19, 2014—Many children have bicycles on their lists for Christmas gifts, but not all parents can afford to grant their children’s wishes. Unfortunately, times are still hard for many families especially during the holidays. Jim Dodson Law decided to help local families have a brighter Christmas this year. On December 15th, six excited children and their families arrived at Chainwheel Drive in Clearwater to receive their Christmas dream gift of a new bike. 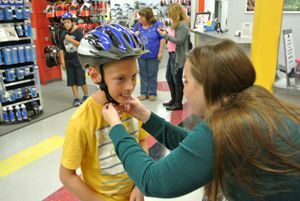 W hen the kids arrived at the bike shop, they were each given a colorful new bicycle safety helmet. 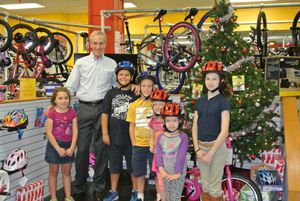 Each child had their helmet properly fitted by Jim Dodson Law’s certified helmet fitter before they were welcomed by a surprise visit from Santa Claus. 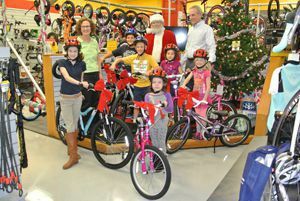 The room was filled with joy as Santa presented the children with a shiny new bicycle topped with a big red bow! Smiles lit up the room as the kids quickly hopped on their bikes and turned on their bright new bike lights. “What these children don’t know is seeing the excitement on their faces makes our Christmas brighter,” said attorney Dodson. For six years, Dodson and Chainwheel Drive have partnered to provide local kids and their families a more enjoyable Christmas. “We look forward to this night all year,” said Dodson. In addition to Dodson’s Bikes for Kids program, the cycling safety advocate provides cyclists with information to help prevent accidents. He is the author of the Florida Bicycle Accident Handbook, which explains cyclists’ rights on Florida roads and the steps to take following an accident.